When you have 10 minutes to get dressed and run to class or work, the last thing you want is to realize you look plain and boring. 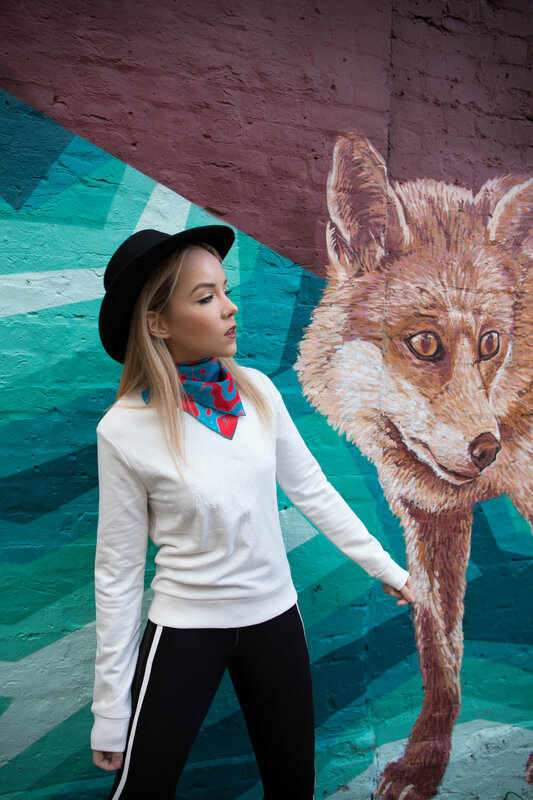 I used to keep a square scarf in my bag or around my wrist to, later on, style it properly at school. Sometimes I would leave with it on and change it in the afternoon. It's so easy to carry around and can easily make any outfit interesting. Compared to jewelry it's more comfortable, so it can easily be worn every day. Once you get with this trend you will find yourself looking for the best patterns to match your wardrobe. They are not only so versatile in terms of style but also in season. You might have this one scarf that you wait all Winter to wear, but truth is, you don't have to. It's a good investment to keep as they are easy to wear, easy to store, elevate your look and give you character. The print in the "target" design is so far my favorite. The way it looks open is just a beautiful as when it is folded. And if I turn it the other side, I can choose to show more of the vibrant yellow and blue instead of the black pattern. It works perfectly with colour. You don't have to match yellow with yellow and blue with blue. Play around and see what you like best. I'd only recommend that the top, dress or sweater you wear under the scarf, should be in a neutral colour such as white, black, beige or grey. Start from there when creating your look. This scarf has a totally different texture. While the "target" design is super silky and almost slides down your hands. The "xoxo" design has less shine to it and can be worn inside out as it looks exactly the same on both sides. My favorite part on these scarfs it to open them up and see the full design, as when folded they look totally different. This one has a grafitti pattern. Who would have guessed? Although the colours are super summery, I made it work for fall winter by keeping the entire look in neutral colours. Remember that you can always tie it on your bag or around your wrist or even on your fedora. This is just my favorite way of wearing it. Dark Flame was the first one to catch my eye. As you might or might not know, the "rockstar" trend is very much alive at the moment, and I couldn't be more into it. 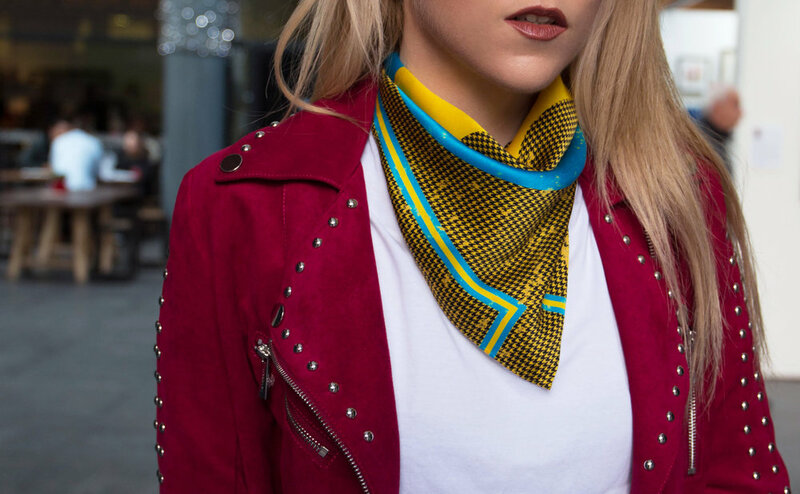 This scarf is a better version of your usual go-to red bandana. I can easily see my guy friends wearing it in all sort of different ways. You really can't go wrong with a classic red. Because these scarfs are super silky they elevate your look in a way that it doesn't look too "rough" making it more of a Saint Laurent vibe instead of a thrift shopper. I made this cool video showing you 20 Ways you can wear your Square Scarf in 1.4 minutes I am sure you're going to love it. There's a few more creative that you can try, if it matches your vibe, just go with it.